Karina Silva is the Program Coordinator for the Mental Health Interventions and Technology (MINT) program at Florida International University. 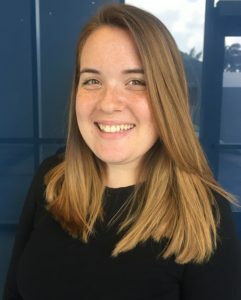 While working towards her bachelors degree, Karina worked for 4 years with children in the Autism Spectrum as an Applied Behavior Therapist (ABA) and joined the MINT team as an undergraduate research assistant. Karina graduated in August 2016 with a Bachelors in Art (B.A.) degree in Psychology, a minor in Education, and a Certificate in Applied Behavior Analysis Studies from Florida International University. Karina continued her pursuit in assisting families through the mental health field by working under the autism strand in the Boston Public Schools as a paraprofessional and volunteering as research assistant at the Center for Anxiety and Related Disorders at Boston University. Karina is mainly interested in furthering her education on global accessibility of treatment for children and adults with anxiety and related disorders.